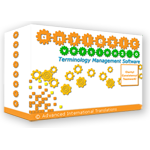 AnyLexic is Terminology Management Software designed to manage terminology dictionaries in a reliable and convenient way: all the terminology is stored in one database. Using AnyLexic you will keep terminology consistency while working under one project with your colleges by dictionary exchanging. AnyLexic is a new generation of the terminology management programs, and is not tied to any particular terminology. It can help you on each stage of translation terminology management process, creation, editing, search, and exchange. Click to download FREE trial version of AnyLexic!